Cryptainer LE is a security utility freeware from Cypherix. Cryptainer LE can securely encrypt any data files and folders, be it in any form textual, graphical, audio or video with 128-bit strong encryption algorithm. It is the easiest way and the cheapest way (free) to ensure privacy of your data. Cryptainer LE has a much more convenient interface than most encryption utilities by acting as a virtual drive (Cryptainer LE refers it as Cryptainer Volumes) that functions as just like a physical hard disk (C: or D:). You can access the virtual drive just like how you would access any physical disk. Thus, data encryption becomes as simple as dragging and dropping files and folders into the vault that is password protected. 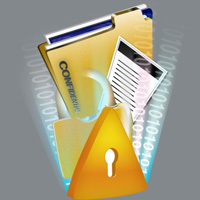 Cryptainer files can only be viewed, accessed, browsed or modified by the user who has the key to open it. At other times it remains invisible. Also, Cryptainer makes it easy to hide all your sensitive information by letting you remove the virtual drive with a single click. Cryptainer LE is the freeware. It’s actually a “miniature” version of Cryptainer PE and Cryptainer. The limitation is that the software can only creates encrypted containers (vaults) of up to 25 MB each to store any type of data. However, more than 1 containers or vaults can be created to increase the amount of data to be encrypted, although you will end up with lots of virtual drive letters. Download Cryptainer LE from here. Additionally, Cryptainer LE lets you create secure e-mail files that you can sent to anyone. The software also includes a ‘Mobile’ feature, which allows it to encrypt all media (including, USB, CD ROM etc). It works on all 32 bit versions of Windows.